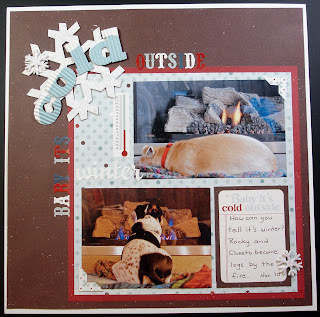 On this Fabulous Friday New Years Eve edition, we have a fantastic blueprint challenge from the lovely Carolyn. Here is her blueprint...isn't it awesome? Thank you Carolyn for this awesome challenge! From all of us at Scrap Shotz, we wish we all a Happy New Year and all the best in 2011. Hi there, Laurel here. 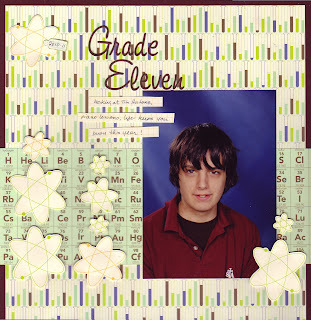 My challenge for you today is anything but a card or scrapbook page. I upcycled a can from some chipboard elements. 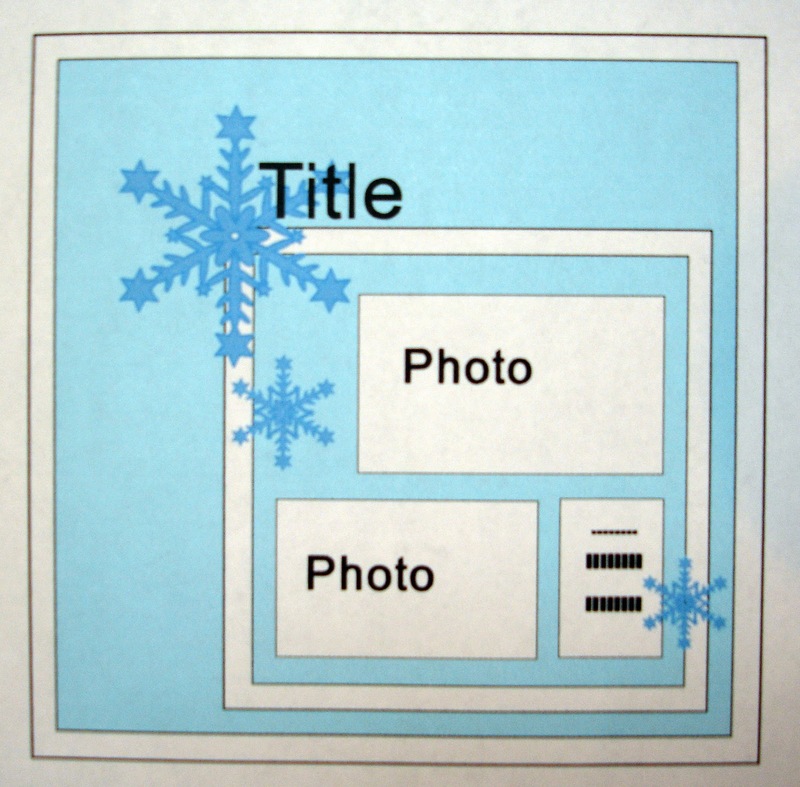 I covered it with paper and stickers from the Echo Park Wintertime kit and made a tag to match. 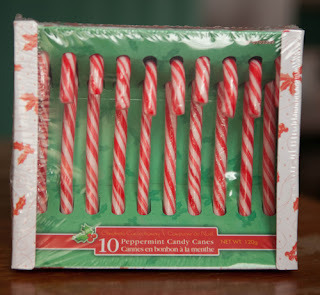 I will put some homemade hot chocolate, some mini marshmallows, mini candy canes and a Tim Hortons gift certificate. This is going to be a gift for our mailman. So I would love to see what you do for my anything but challenge. Thanks - enjoy your Christmas Eve! 2 more days until Christmas; are you ready? 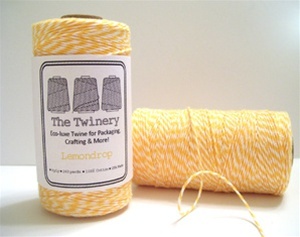 Here is a quick and super fun gift idea from Stephanie! If you’re looking for an inexpensive easy to make gift to hand out over the holiday season, here’s a great idea that I saw on a blog. 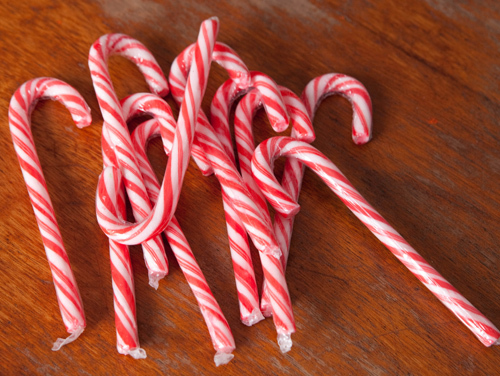 Start with a box of candy canes. Remove them from the box but leave them wrapped. 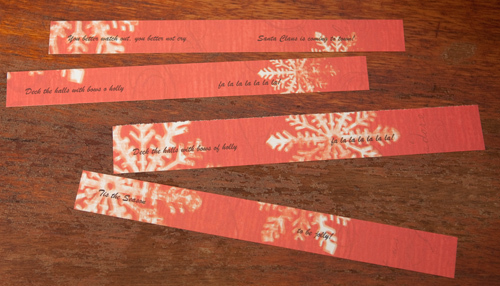 Go to your printer and print up a bunch of Christmas sayings in strips. Leave space between the lines and cut the strips. 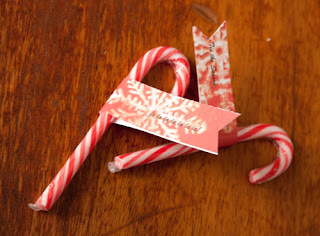 Put a small amount of adhesive in the middle of the back side of the strip and fold it around your candy cane. More adhesive will hold the ends together. Trim the ends with decorative scissors or just clip. Now you have a small gift for your children’s friends, the baby sitter, or the children in your neighbourhood! These are just darling! Thanks Stephanie for your inspiration! 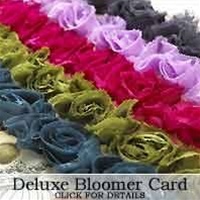 Looking for the perfect personal touch to any gift or card? Well, design team member, Laura Gilhuly has the perfect tutorial for you today! 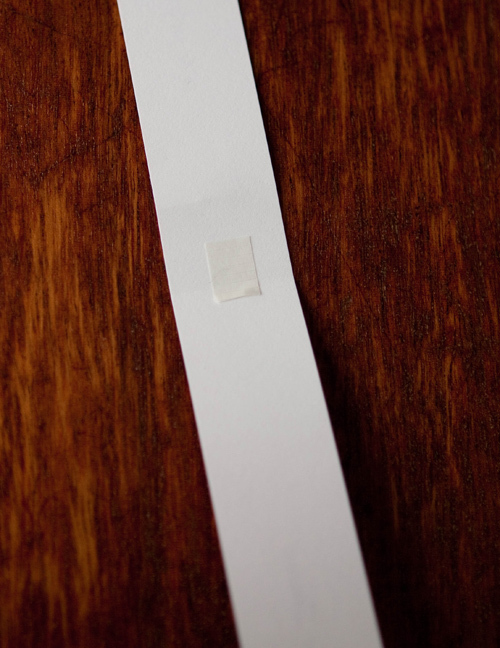 4) put some hot glue on your punched circle. 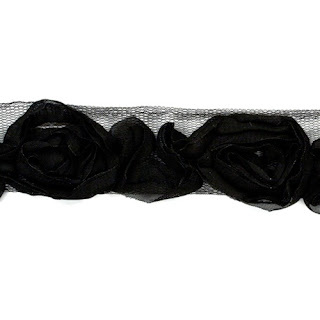 and voila you have your own rosette! Thanks Laura for the inspiration! Yum yum yum is all I have to say!!! 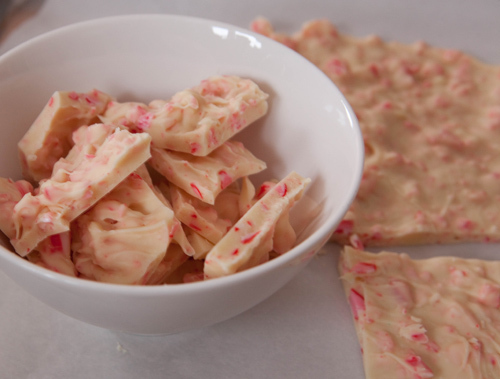 Here is Stephanie's super secret candy cane peppermint bark recipe. Thank you SO much for sharing Stephanie! I started with a really good quality Belgian white chocolate. Generally speaking, the better quality chocolates have a higher cocoa solids content and will melt really easily. 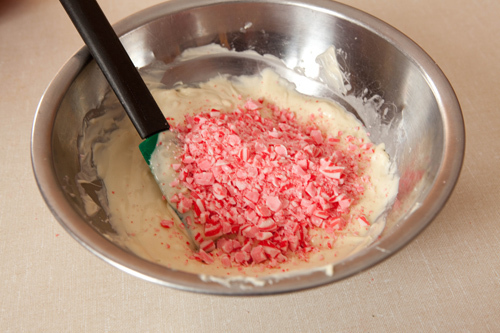 Be careful with white chocolate as it will burn if you heat it too much. Here we go! Melt about 2 cups of white chocolate. I used a double boiler for mine. While this is melting, take your candy canes and remove the wrappers. Next you will need to break up 12 candy canes. I put mine in a double Ziploc bag and used a hammer. Don’t pound them too much as you want small pieces but not dust. Add your broken up pieces to the melted chocolate. 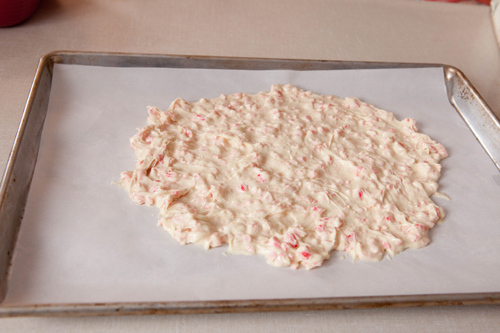 Stir these up together and spread the mixture on a parchment lined baking sheet. Place the sheet in the fridge to cool. Once it’s cooled, break into smaller pieces and enjoy! I just love browsing through the gallery lately... everything is looking so festive! It really gets me in the mood for Christmas! Our card tag this month was a lot of fun... and I'd like to share this card posted by Dawn... I just love how she stamped the sentiment on the Christmas ornament! Hope all your holiday crafts are coming right along. Please drop by the gallery and share them with us! On this Fabulous Friday, we have an awesome Chromotherapy Challenge from Laura. When I think of winter I think of the bright blue skies and white snow so for this month I am going to make it easy (I know everyone is super busy this time of year) I want to see you use these two colors (and variations of) in your project! have fun ladies! Thank you Laura for this great challenge! I love love love Laura's inspiration for today. I cannot tell you the number of times that I have run into a problem finding an evelope that will fit! Grrrr!!! We all have those white sheets of paper that come in our new albums. Really what do you do with them? 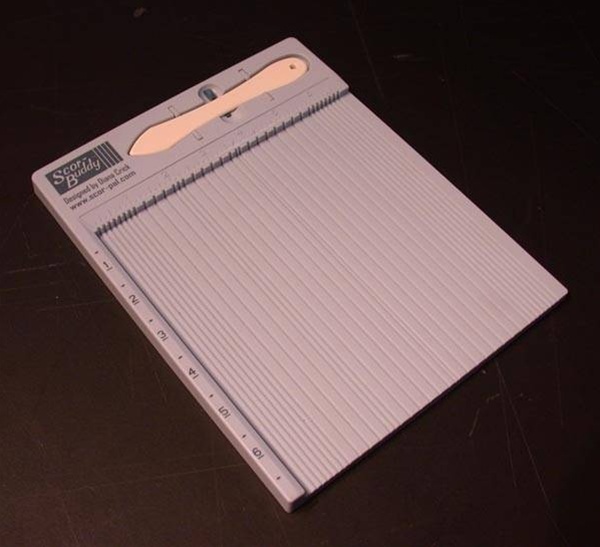 Well they are perfect for making envelopes for larger cards. 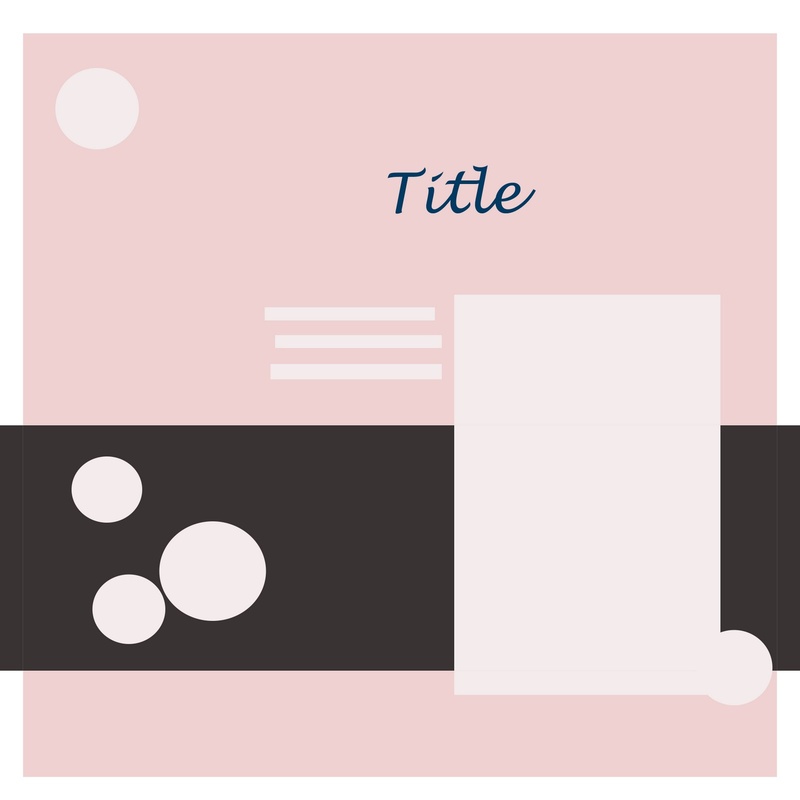 The one I created for this is perfect for those 6 1/4 x 6 1/4 cards. 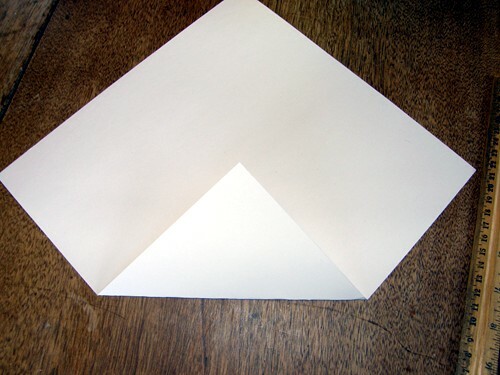 You can go smaller or bigger, just adjust the size you cut your square. 1) Cut your paper in a square and mark the center. 2) Lay it in front of you like a diamond. 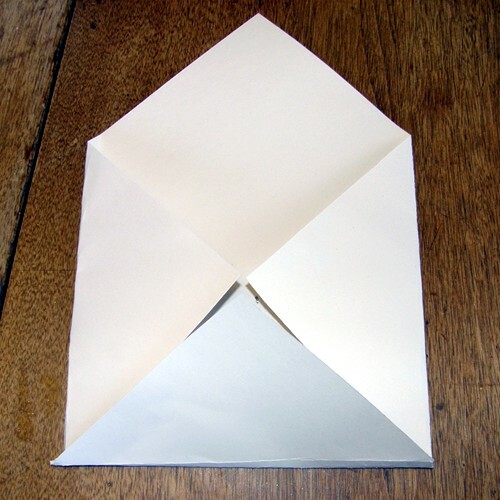 Fold up the bottom so the peak touches the center. 3) Fold the bottom down again and fold in the two sides so their peaks touch the center. 5) Apply a bit of strong glue (I used aileens white glue) and let dry. 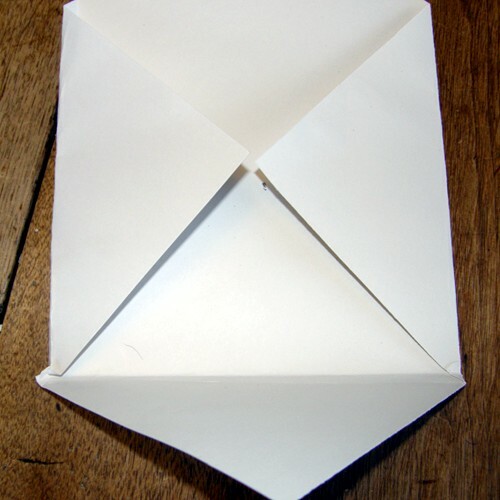 6) Fold down the top. 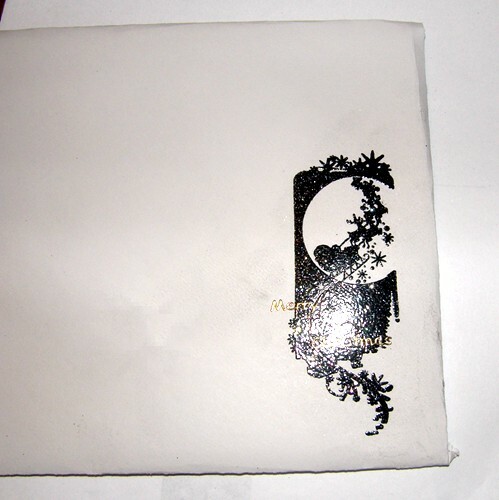 Thanks for showing me how to make a custom envelope Laura! Are your loved ones scratching their heads on what to get you for Christmas? 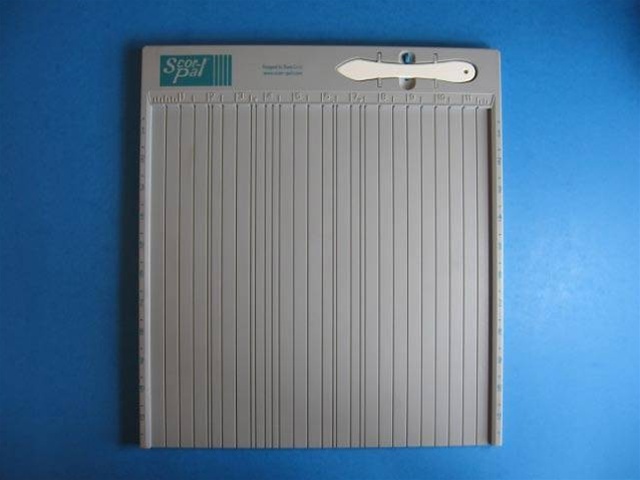 Or as you pondering what to purchase for the papercrafter in your life? 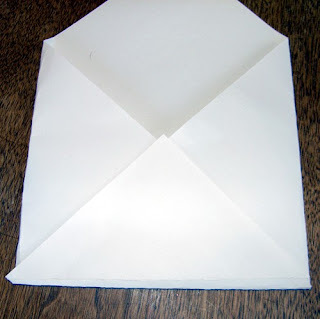 Well, this post is for you! 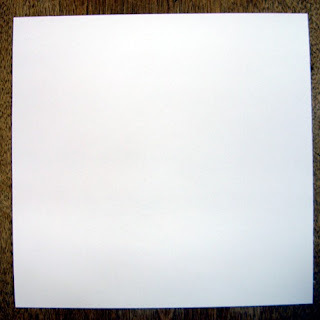 I've scoured the Scrap Shotz store and rounded up what I think would be a thoughtful and wonderful gift to receive this year. In David Letterman style, let's start with #10! If your MoJo goes missing, just pick up this fantastic book by Becky Fleck. She is amazing and this time she has included card sketches and digi sketches along with her awesome layout sketches. Coming in with #9 is Copics! With the amazing array of colours, it is no wonder these pens have taken the scrapbooking and cardmaking world by storm! 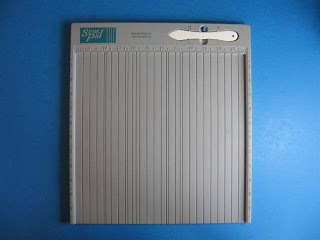 And in the #8'th position is the Scor-Pal or its baby sister, the Scor-Buddy. I am primarily a scrapper but let me tell you, I use the Scor-Buddy all.the.time! I love it! 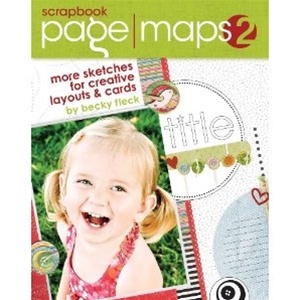 The 7th position is the Scrapbook and Cards Today and Becky Fleck Page Maps joint product, the 2011 Calendar. This is a beautiful keepsake. And how about this beauty in the 6th spot? Every girl deserves some luxurious ribbons and these beautiful ribbons from Websters Pages and American Crafts do the trick! 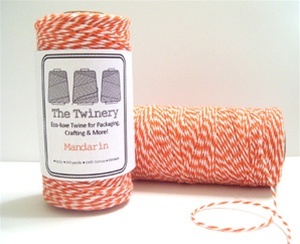 Holding the 5th position is one of the hottest fibres in the industry, twine from The Twinery. Gosh, the colours are endless. Here are just a few to whet your appetite! The 4th position is the typical gift that keeps on giving! 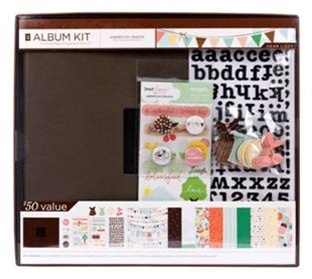 I am talking about the American Crafts Dear Lizzy album kit. Gosh this kit is loaded to the brim with papers, chipboard elements and stickers...and and and...an album too!!!! This is an awesome gift for the beginner, novice or expert! Ooooh I'm into the Top 3 now!!! 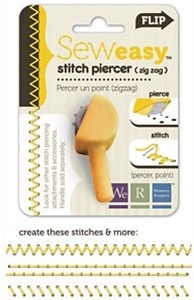 OK the 3rd spot is the We R Memory Keepers Sew Easy Tool. 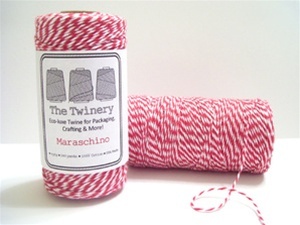 If you love the hand sewn look, you will love this tool. The handle and heads are sold separately. This is versatility plus! 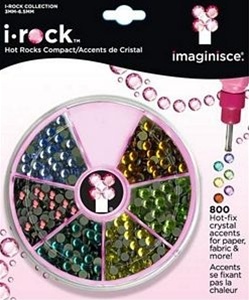 The 2nd position is an Imaginesce iRock and gems. This hot little tool is priced well and will last for a very long time. What do you think?? What do you like? I would love to hear from you! Today we have some great inspiration from team member, Laura Gilhuly. Every year we do our Christmas layouts and cards, so I thought I would help out with some titles, poems and quotes you may want to use on those merry layouts! 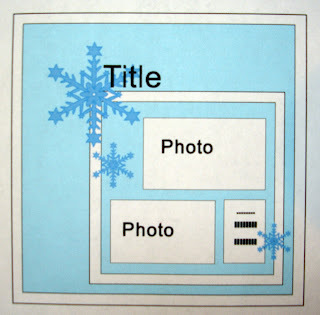 Here is Laura's layout titled, My Christmas Miracles. Thank you Laura for this great inspiration! Today we have an awesome Blueprint Challenge for our Fabulous Friday series from Stephanie Schan. Beautiful Stephanie! I look forward to seeing your interpretation in the gallery! I was going to say that there is Inspiration Everywhere at Scrap Shotz for the month of December but Jessica Sprague stole my line! LOL I am hoping that you will check the Scrap Shotz blog regularly throughout the month of December for some holiday inspiration. At our house, we start every December, no matter how old you are (!) with the advent calendar. Over the years I seem to have accumulated various advent calendars. Sure, I have a few "fun" calendars that are filled with chocolates and fortunes for fun things to do and I also have some that tell the story of Christmas. My family loves both! 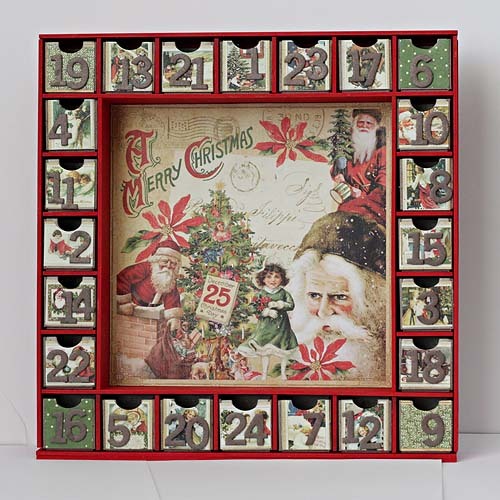 This year I put together my Kaisercraft advent calendar using the Graphic45 Christmas Past papers. I love everything about the calendar and the papers. The advent calendar and papers can be purchased through Sandy - just give her a quick email or click on the links to shop online. 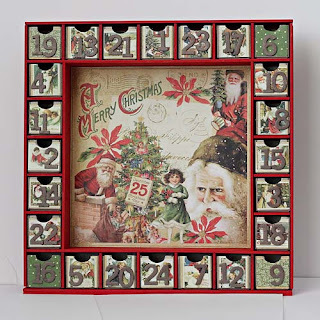 Advent calendars come in all different shapes and sizes. I encourage you to be inspired by my calendar and make a version all your own! 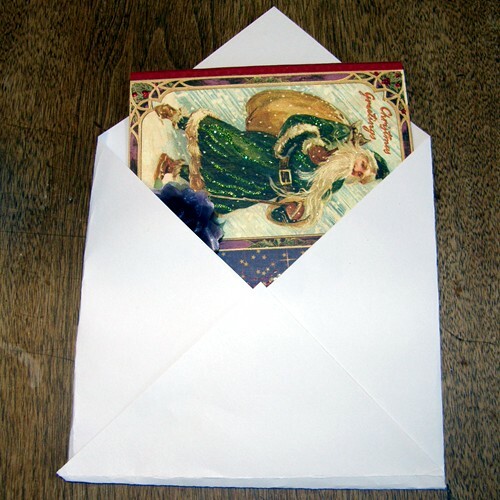 Please link me up to your advent calendar! It's Scrap Shotz's December Reveal!